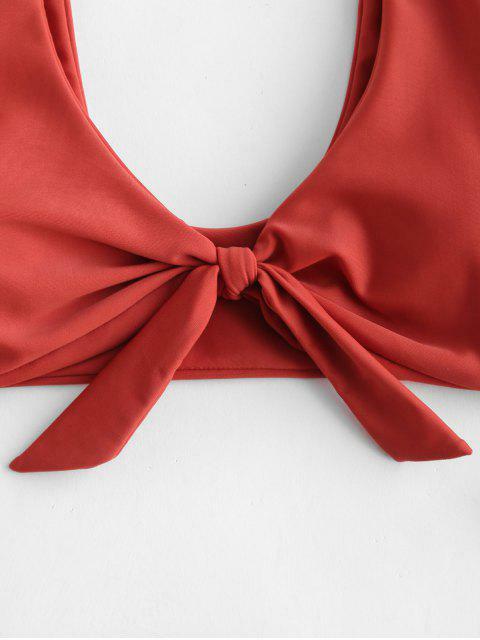 [41% OFF] 2019 ZAFUL Front Knot Plunge Bikini Set In CHESTNUT RED | ZAFUL ..
Super cute and feels like super nice material. True to size in my case and cheeky. I’m 5’4” 130 and I chose a small which fits great. I love this one a lot! Super cute swimsuit! It fits great aside from the top but that’s just because I have a smaller bust. It looks exactly like the pictures with the exception being that the tie front is a separate piece of fabric, which I wasn’t expecting. Obviously a true to size swimsuit, as most of zaful is. A slick and supportive tank bikini top gets a knot in the middle that creates a sultry plunging collarline. And the super high-cut briefs are classic and versatile enough for wherever your vacation takes you.